The war on sugar is in full swing. How can you help your customers make better choices? Coca Cola is offering up a $1 million prize for a new sugar alternative. Nestle devised a technology to reduce sugar content by as much as 40 percent in some of its confectionary products. And seven U.S. cities have implemented soda taxes. Yes, the war on sugar is on. 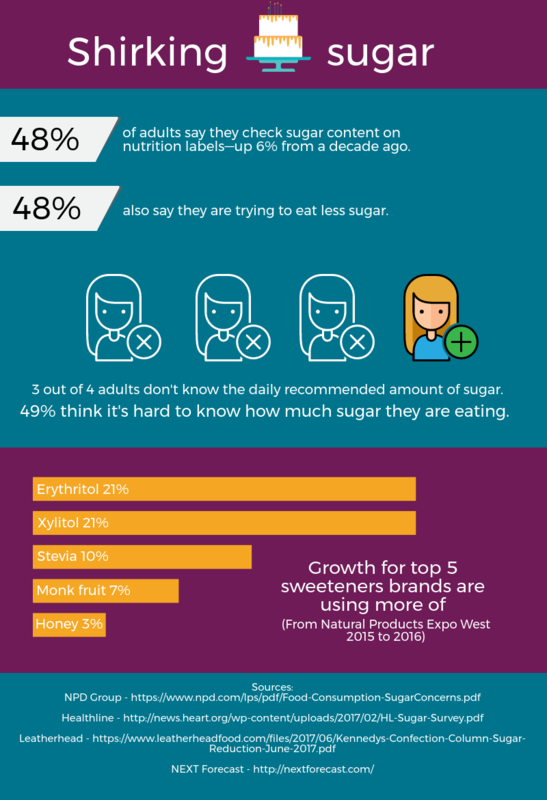 As consumers seek healthier foods, even better-for-you brands like KIND and Stonyfield have made efforts to reduce the sugar content in their products. And ingredient companies are hard at work on low- or no-calorie alternatives. According to NPD Group, sugar avoidance spans all age groups, but older adults are particularly likely to say they’re trying to eat less sugar. In a Healthline survey, 40 percent of respondents said their biggest food guilt came from eating too much sugar—even more than carbs and fat. But ditching sugar is hard. One thing that could make it easier is the new Nutrition Facts Panel, which includes a line disclosing how much added sugar is in a product. But the FDA has proposed extending the deadline for brands to comply with the new regulation until 2020. How can you help your concerned customers consume less of the sweet stuff? Here are some insights to spark inspiration.